The other thing that we have seen a lot of in respect of leadership, or some people would say we have seen a lot of, is shifting the blame… Everybody admitting that it was partly their responsibility and they’re sorry for that, but actually, “It wasn’t really my responsibility and these are the 15 reasons why somebody else was responsible for it”. Now, not everybody who has come before the inquiry has done that, but there has been a degree of that that we have heard through the evidence… Now, I mean, some people would say that that demonstrates a degree of lack of – firstly, lack of self-understanding, but, secondly, not realising that actually it’s okay to say that you get things wrong. So the Archbishop of Canterbury is clear when it comes to allegations of child (sexual) abuse and safeguarding: passing the buck by insisting ‘It’s not my job, mate’ evidences a lack of humanity and leadership – deficiencies in integrity and gifting which certainly ought to disqualify someone from holding a senior ministerial office in the Church of England. 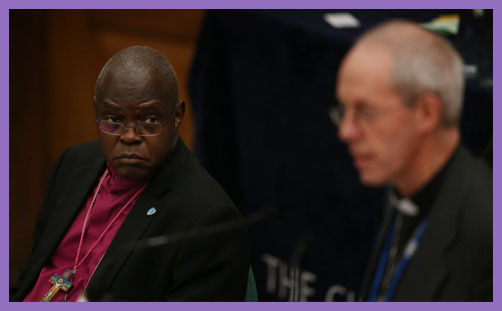 We can confirm that the Archbishop of York responded to a letter he received from Matthew Ineson in June 2013, in which Matthew Ineson enclosed a copy of a letter to him from the then Bishop of Sheffield and his own response to the Bishop. The Archbishop did not fail to act on any disclosure made. As the Diocesan Bishop has responsibility for matters such as these in their diocese, this is a matter for the Diocesan Bishop to inform the Diocesan Safeguarding Adviser (Protecting All God’s Children – the Policy for Safeguarding Children in the Church of England, section 4.5). For this reason, the Archbishop acknowledged Matthew Ineson’s letter and assured him of his prayers. This looks bad for Sentamu. He receives a written disclosure from Mr Ineson (an Anglican priest himself) who reports that he had been repeatedly raped by a clergyman (Devamannikan) when he was a (vulnerable, homeless) 16 year old, that he has disclosed this to Bishop Stephen Croft and others several times and no action has been taken. He has received no support, no investigation, no reparation. And Sentamu says, in effect, just keep trying with Croft can you. Not my problem. Surely Sentamu had (a) a moral duty of care (b) oversight of croft especially on disciplinary matters (c) a responsibility to disclose to the police, or at least to refer the matter to some internal or external safeguarding body to escalate it? In the context of being repeatedly ignored, how must Mr Ineson now feel to have this statement about him put out by the CofE? Suicidal is one obvious answer. He is being treated as a ‘case’ and a problem not a suffering, hurt, human being who has a serious and entirely credible allegation of abuse. What is stopping people from doing the right thing? The headline to this blog post appears nowhere on the BBC or in the Guardian or on the rest of the MSM. It isn’t even covered in the Anglican/Christian media which has been drunk on IICSA all week. Why is this? Is it because the Archbishop of York is basically a nice bloke? Is it because he’s getting on a bit and is about to retire? Is it because he’s in favour of higher taxes or is anti-Brexit? Is it because he goes round quoting Marx and preaching the gospel of statist socialism? Is it ‘cos ‘e is black? If the Archbishop of Canterbury had publicly rebuked and shamed a pale, male and stale Tory-inclined Brexiteer bishop for lacking humanity and leadership, don’t you think we’d be hearing a bit more about it – at least on the BBC and in the Guardian?